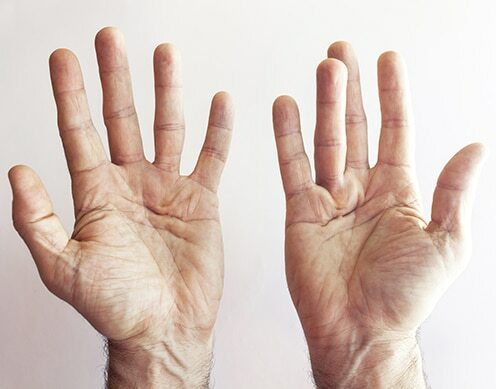 Dupuytren’s disease is thickening and eventual contracture of the tissue just under the skin of the palm or fingers which progressively prevents the patient from straightening their fingers. It is called the curse of the Vikings, as wherever the Vikings conquered and spread their genes, their descendants are more prone to Dupuytren’s disease! Other risk factors include diabetes, previous hand injury, working with vibrating tools and some medications (for example anti epileptics etc). Dupuytren’s disease also has a high recurrence rate, especially in some patients with additional risk factors (Dupuytren’s Diathesis). Dr Safvat will discuss strategies to minimise this post-operatively. It starts usually as small pits or lumps underneath the kin of the palm. As the disease progresses, some rope-like structures develop under the skin (cords). They eventually spread to the fingers and cause the fingers to remain bent into the palm. The little and ring fingers are most commonly affected and one or both hands can be affected to the same or different extent. Dupuytren’s disease is typically not painful but may be distressing to patients as it may interfere with their hand function. Progression is unpredictable. Some will have the disease for many years and not bother about it while others will develop finger contracture and functional disability early. Dupuytren’s disease does not affect the tendons that are deeper structures but may wrap around the nerves and the arteries and displace them. In its severe (familial) form it may affect other parts of the body such as the back of the hand and soles of the feet. Mild Dupuytren’s disease is usually managed by non-surgical means. These include Vitamin E cream, splinting, steroid injection into the cords and nodules. When the cords start to interfere with hand function it needs surgical intervention. There are different options for this with different success and risks. Dr Safvat will discuss these in detail with his patients beforehand. Hand Surgery is one of Dr Safvat’s interests and area of expertise. For most patients, surgical excision of the cords and release of the contractures is the most appropriate option. Sometimes a skin grafts may be needed to replace the contracted skin and prevent recurrence. The surgery is performed in an accredited hospital, under a general anaesthetic. The procedure is done as a day only procedure without the need to stay overnight in hospital. The hand and wrist is usually wrapped in a splint and bandages and patients are discharged with a sling to elevate their hands. The dressing needs to stay dry and intact for two weeks when Dr Safvat will remove them. Patients will need to wear a splint at night for up to three months and have hand therapy to help with their hand function, and prevent recurrence. All operations have risks and Dr Safvat will discuss these in details with his patients beforehand. In addition in Dupuytren’s disease as it wraps around the nerve and arteries of the fingers, there is a small risk of damage to these structures. This is often partial and temporary. Depending on the severity of the disease and the number of joints affected at times it may not be possible to completely straighten the fingers, but significant improvement is usually possible.